A five-story tall investment in technology will allow an Aberdeen-based manufacturer to double its production capacity in the coming year. Reliance relocated its operations from Florida to the former Plastics Packaging buildings at the corner of N.C. 5 and Anderson Street, in late 2014, and utilizes a three-part manufacturing process to melt down plastic pellets to create film for thin-plastic garden mulch bags, which are printed and cut on-site into the final product. “We make millions and millions of bags,” Compton said. To meet customers’ demand, the company embarked on a yearlong effort to expand its operations footprint and production capacity. In February, the Aberdeen Town Board approved a request for a new community economic development grant to help offset costs to repair the roof and electrical capabilities of the adjacent 130,000-square-foot warehouse purchased by Reliance. Construction of an 8,000-square-foot, five-story addition was completed in September by local contractor Sandhills Building Systems, and the new extruder will begin production this month. In addition, a new high-speed printing press was also purchased and brought online this fall. In total, Reliance invested approximately $4 million for equipment and $1.5 million in building improvements. The new manufacturing line will increase production by 30,000 pounds of product, in effect doubling the company’s current daily capacity. Another existing extruder on-site is also being rehabbed and, once all five lines are operational, the plant will exceed 60,000 pounds of film per day. Sharma initially relocated Reliance to the corner of N.C. 5 and Anderson Road in Aberdeen, in late 2014. The property had previously accommodated a similar type of manufacturer but had sat empty for several years. 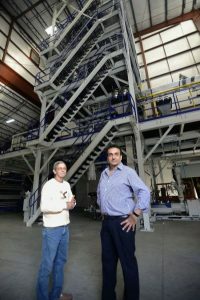 Reliance invested six figures to make the building operational, four existing plastic extruders were rehabilitated and newer equipment was installed in a joint venture with Sigma Plastics Group, of Lyndhurst, N.J., which owns the property. For more information about Reliance Packaging, visit www.reliancepkg.com.